The Backwards K is a sports-themed inspirational novel written by J.J. Hebert. It was the defining moment of his young life, the goal every kid who’s ever played baseball has ever dreamed about. Jet Brine was at bat for his team -- the Boston Red Sox. His fans, who had followed his meteoric rise to fame straight out of high school, were shouting out his name and cheering for his team. Jet could remember the thousands of times he had been at bat since he was young, could feel that satisfying impact of ball hitting bat, the crisp cracking sound, followed by the hushed awe of the crowd as they followed the ball’s trajectory. But this time, at this most crucial moment, when the World Series win depended on him, something awful happened. First, he swings and strikes, and the shock of it seems to freeze him, to end the effortless grace that had gotten him this far, and the next two strikes fly by untried for. Years later, an older, sadder Jet would pack up his old playing cards and other memorabilia and join the graying ex-athletes at the succession of collector shows held in conventions across the country, where he’d haggle with dads who’d try to bargain down his prices. 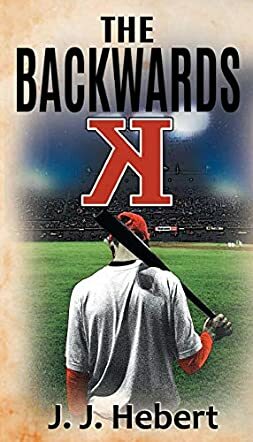 J.J. Hebert’s inspirational sports-themed novel, The Backwards K, follows the efforts of aging baseball great, Jet Brine, as he tries to get past that awful defining moment of his baseball career and reclaim his life. Hebert’s story examines the concepts of forgiving oneself for the past and finding the courage to start fresh and new. Jet’s first real job as data entry clerk will feel remarkably true to life to most readers who’ve ever worked in a company setting, and his interactions with his coworkers and peers feel authentic and real. Hebert also addresses addictions and the havoc they can wreak on good people’s lives, and the difference that having a support structure can make when trying to change addictive behavior. In Jet’s case, it’s gambling that calls out in a siren song whenever things get bad, and the relationship between him and his sponsor, Boone, as they work to conquer that addiction is a marvelous thing to read. The Backwards K is an uplifting and inspiring tale that is most highly recommended.